the final polish of the OPI 2012 Holland collection is OPI Kiss Me On My Tulips (is it me or does that sound really naughty? ), which we'll be comparing to OPI That's Hot! Pink. i can't believe how similar they are in color! the formulas, on the other hand, are hugely different. they are bright, cool pinks, as you probably gathered from the names... they are both your typical hot pink. TH!P is slightly warmer than KMOMT... but unless you are really looking, you can't tell. in terms of formula, KMOMT blows TH!P out of the water! i did two coats of each... KMOMT was perfectly opaque in two coats, while TH!P shows visible nail lines and was streaky on top of that. you slightly see the nail line on my middle finger, it was actually more visible in real life... how often does that happen?! one coat Seche Base, two coats of each on their assigned fingers, one coat Seche Vite. you definitely don't need both of these polishes... if you are in the market for a hot pink, run grab up KMOMT! i'm glad i have it so i can put TH!P in the give to friends drawer... i know i won't be using it again. OPI You Don't Know Jacques! OPI Wooden Shoe Like To Know? OPI Red Lights Ahead... Where? 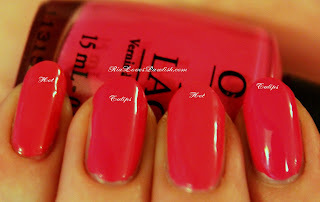 OPI I Don't Give A Rotterdam! Dutch 'Ya Just Love OPI? OPI Did You 'Ear About Van Gogh?